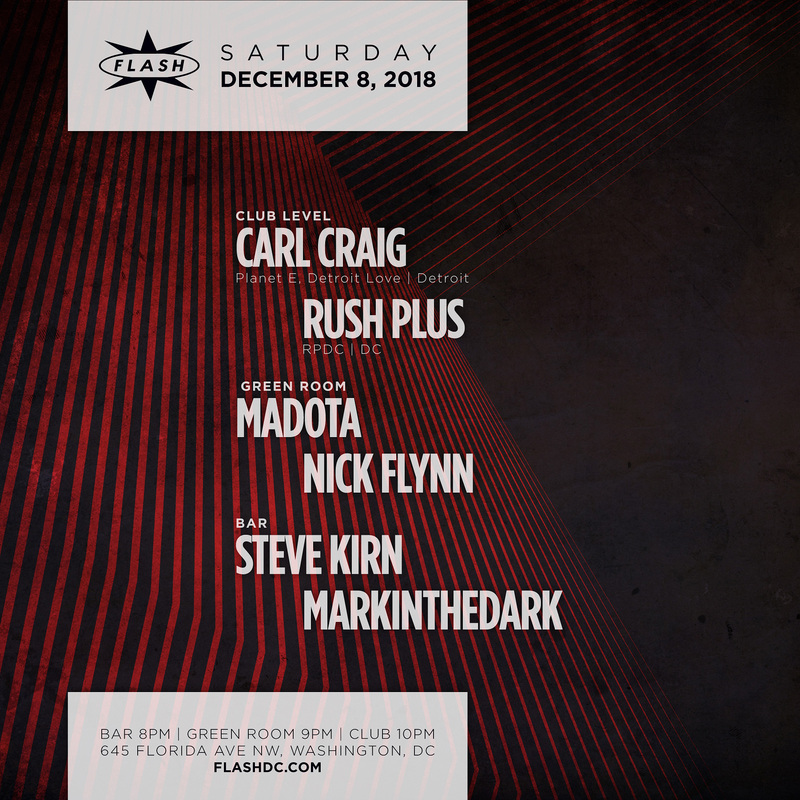 Carl Craig is described as a creative visionary, an electronic music icon, an esteemed Grammy-nominated composer, a world-class DJ and an ambassador for his native Detroit. Yet the common thread that runs through Craig’s broad musical canon and creative projects is a resounding fascination with futurism. The prolific producer has cultivated a unique path as an artist, entrepreneur and civic leader, guided by his tendency toward forward thinking.“My livelihood is making music that I can perform, whether I’m doing orchestral production or modular strangeness or generating club music. I don’t restrict myself,” said Craig. “I defined myself by being who I am. The ultimate self respect is when you say you’re going to do something and you go and do it to the best of your ability.”Craig released his first track in 1989 on a Virgin UK compilation album, two singles followed on labels run by his first collaborator, Derrick May. After a series of ambitious releases for his co-owned Retroactive imprint, in 1991 Craig launched his record label Planet E, with the groundbreaking EP “4 Jazz Funk Classics”, under his alias 69. Planet E turned 20 in 2011 and Craig celebrated the label’s history by taking Planet-E and its artists and collaborators on a world tour for the first time in the label’s history. As well as this, Planet E invited friends of the label – including Luciano, Kirk Degiorgio, Loco Dice and more - to pick their favorite Planet E track to remix and re-release. Reflecting a year that was packed with events and releases, Craig readily admits that when he started the label he was hoping “it would last forever.” He cites artistic freedom as the highlight of running the label and adds, “It was never a struggle for the label to be an outlet for my or other people's music. It was always a struggle to stay in business, actually a war to stay in business.” Looking back now to Craig's early releases from 1989-1992, one can see how much the wild variety found in his early music set the groundwork for his diverse career. He's fortunate to serve as an inspiration and influence to countless artists in the underground electronic music scene, as well as crossover acts like Caribou, Underworld, Hot Chip and LCD Soundsystem. His 1992 Innerzone Orchestra cut “Bug in the Bassbin” was credited as the spark that inspired the evolution of drum‘n’bass. In typical Craig fashion, “Bug...” continued to develop, morphing into a live jazz composition in 1996. In turn, those experiments laid the ground for Craig to incorporate Jazz elements onto his 1999 I.O. album “Programmed.” Then in the 00's Craig explored jazz further still as producer on the albums “The Detroit Experiment” and “Rebirth” (2009) for legendary Detroit Jazz collective, Tribe. This is but one example of Craig's continually evolving exploration of sound.Craig’s prolific nature is reflected in the many recording projects he has used throughout his career including 69, BFC, C2, Innerzone Orchestra, No Boundaries, Psyche, Paperclip People and Tres Demented. This rotating cast of aliases has enabled him to continually explore new directions through a long succession of full length albums, mix CDs and singles including “Throw” (1994), “Landcruising” (1995), “The Secret Tapes of Dr Eich” (1996), “More Songs About Food and Revolutionary Art” (1997), “Programmed” (1999), “The Detroit Experiment” (2002), “The Workout” (2002), “Just Another Day” (2004), “Fabric 25” (2005), “The Album Formerly Known As” (2005), “Paris Live” (2007), “Sessions” (2008), “Recomposed” (with Moritz Von Oswald) (2008), “The Legendary Adventures of a Filter King” (2009), “Modular Pursuits” (2010), “Last Decade” (2012), “Masterpiece” (2013) and Green Velvet collaborative album “Unity”, which was released as a surprise album in 2015, bringing the sounds of Detroit and Chicago together.Craig’s interest in collaboration continually grows and is realized in full with ‘Versus’, one of his boldest endeavors to date. For ‘Versus’, Craig merges techno and classical music, opening himself up to working in a new format by collaborating with pianist Francesco Tristano, French orchestra Les Siècles, conductor Francois Xavier Roth and Moritz Von Oswald. Inspired by well-received performances in concerts halls in Paris, Milan and Germany in 2008, Craig started the process of developing the project into an album, which features eight of his techno masterpieces recomposed into classical pieces. Versus the album will be released in the summer of 2017. There will also be a tour alongside, as the Versus Synthesizer Ensemble, where Carl Craig will be joined on stage by five musicians, together interpreting the music from the album onto a synthesizer wall.Craig also performs as a Trio alongside Von Oswald and Tristano. His occasional appearances with the electronic collective jam band Narod Niki, alongside Ricardo Villalobos, Luciano, Richie Hawtin, Zip and others, led to him appearing in part live / part DJ gigs with Luciano. Additionally, he’s taken to bringing keyboardists like Mike Banks (UR), Amp Fiddler and Francesco Tristano into the DJ booth with him for special one-off gigs. As well as performing select international live shows as Modular Pursuits – playing live modular synthesizers, where people never know what to expect. These mixed performances add some variety in a non-stop DJ schedule that finds him spinning at top clubs worldwide. In 2012, Rolling Stone named Craig one of the top DJs that rule the earth and the same year he also featured on the cover of Mixmag magazine. In 2015, Craig was named in the top 100 DJs of the year for Resident Advisor. Craig acknowledges, “Touring has always been the most important aspect of the music industry for artists. There will always be that desire for human interaction.” Let’s also mention that he recently performed live soundtracks to films, first in Amsterdam then in New York, where he improvised live to an Andy Warhol film at Unsound Festival. The fact is unpredictability is the only predictable thing about Craig and his music.Outside of his Planet E recordings, Craig also continues to be one of the most sought-after remixers in the world. He has produced a seemingly never-ending list of remixes that now extends over 100 cuts, including mixes for the likes of LCD Soundsystem, Hot Chip, Junior Boys (Grammy Award nominated), Gavin Russom & Delia Gonzalez, Theo Parrish, Tori Amos, Can, Goldfrapp, Friendly Fires, Boris Blank, Aphrohead, Tom Trago, Slam, Caribou, Tiga, Unkle, Henrik Schwarz, Nicole Moudaber, Pet Shop Boys, Life & Death, tINI, Yello and others. He was nominated for a Grammy in 2008 for his mix of the Junior Boys “Like a Child.” “It’s been proven that the remix is a valid art form,” Craig said. “When I take on a project, the ultimate goal is that it becomes my record. In many cases I’m actually recomposing the track and the time that I spend reflects how personal it becomes.” Always delivering the magic touch, Pete Tong gave C2’s remix of Caribou’s “Your Love Will Set You Free” the first Essential New Tune of 2015, which led to over 1 million plays on soundcloud.In the same way that he likes to make tracks he's remixing his own, Craig’s commitment to his home in Detroit is also something very personal. After launching a festival to rival that of any in Europe with the Detroit Electronic Music Festival in 2000 (now entitled Movement, which today he still has a strong role in). This commitment to Detroit music also extends to how his Planet E family of labels is run. Not only has it given a home to a wide range of Detroit-based artists including Francesco Mora Catlett, Naomi Daniel, Flexitone, Jason Hogans, Kenny Larkin, Monty Luke, Ezana Harris, Moodymann, Niko Marks, Mike Agent X, Terrence Parker, Oliverwho Factory, Recloose, Reference, Kevin Saunderson, Big Tone, Tribe, Urban Tribe, and Chaz Vincent, it has also been serving as a distributor for Detroit imprints including Derrick May's Transmat and Stacey Pullen's Black Flag. “The reality of the business is that you have to change. That’s a very difficult process, especially as an independent. I made a conscious decision a few years ago to invest in what I do. It’s turning it around and putting it into the studio and the label for my music to develop. We’re fighters around here. We fight to find new ways of selling. We do manufacture vinyl and there are people who want it. We’re fighting to keep it alive. Fighting for music that we have a vision for,” Craig says about Detroit. “My commitment to the city is like a commitment to your family. I’ve been here all my life and I’ve seen great things happen elsewhere, why not be involved in making my home great?”In 2014, Carl Craig began a new event concept ‘Detroit Love’, designed to bring together and support the sounds of Detroit and take a little of the techno brotherhood to clubs and festivals the world over. “My love for Detroit is my inspiration, my inspiration is ‘Detroit Love”, says Craig. Detroit Love launched at ADE 2014, in the underground recesses of Amsterdam’s North Sea Jazz club. Craig invited Detroit natives Recloose, Moodymann - who played a set encompassing disco, soul, house and hip-hop, and Mad Mike Banks to play keys over Carl Craig’s Moog infused 4-cd-deck closing set, which included live editing, sampling, scratching and looping of soundscapes ranging from ambient textures to masterful techno. A Detroit focused line-up, showcasing only a few of the sublime talent that Detroit has to offer, the launch was a special and unforgettable night for those who attended. Detroit Love continues to tour in select venues the world over, bringing the special Detroit magic wherever it goes, with standout shows in Detroit, Barcelona, Madrid, Berlin, Paris, NYC, LA, San Francisco, London and Ibiza.When Craig explains his philosophy, his wry sense of humor seeps into his explanations of far-reaching concepts that merge worlds together. “I have a very special career. When I feel that I’m tired of going on the road I can go in the studio. When I’m tired of concentrating on the studio I can go on the road. I can work with concert pianists, jazz musicians or rock guys. Very few people have that range of interests. Very few people juggle a career that they choose specifically.” No one else can pull it all together quite like Carl Craig.